You are here: Home / Ethnic Groups / The People of Maluku / Who are the Ternate? The Ternate people live on the small island of Ternate, near the larger island of Halmahera in the of North Maluku province. The area of Halmahera and the surrounding islands covers about 6500 square miles. Half of the Ternate people live on the island of Ternate, while the other fifty percent have migrated elsewhere, but still identify themselves as Ternate. Ternate people speak the Ternate language. Linguistic experts classify this as a West Papuan language, part of the North Halmahera language cluster, rather than a part of the Austronesian language cluster dominant in most of Indonesia. The Ternate language is part of a larger linguistic grouping called the North Halmahera which also includes Galela, Laba, and Tidore. The livelihood of most Ternate people comes from farming and fishing. Besides growing rice, vegetables, legumes, and sweet potatoes, they cultivate cloves, nutmeg and coconuts. Cloves, which were a special attraction for European colonial powers, have a long history in Ternate. Sailors from Ternate are famous for being strong and capable. Ternate villages are usually built along roads running parallel to the beach. Houses in rural areas are made from woven grass. In the urban areas houses have a variety of structures. 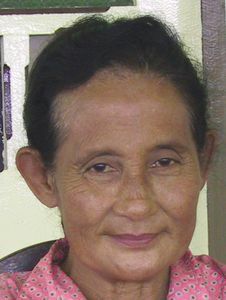 Before the arrival of Islam, the Ternate community consisted of family groups, each led by a momole. After the coming of Islam, these leaders gathered into a confederation which was led by a kolano. Later, as Islam gained influence, the group of kolano became a sultanate. In the kolano structure, genealogical and territorial structures were unifying factors. Under the sultanate, Islam became the unifying factor. The Sultanate of Ternate still exists, but only in symbolic form. Most Ternate people are Muslim. As followers of Islam, they believe they will be judged based on their knowledge of the Qur’an and their deeds during life on earth. In the past, the Ternate sultanate, along with the Tidore sultanate, was a main disseminator of Islam throughout eastern Indonesia. The Ternate people need assistance to develop more modern and efficient farming methods. They also need effective efforts to develop and process their abundant natural resources. Three fields in special need of assistance for development are forestry, oceanic resource development and farming. The Ternate Sultan’s palace and the ancient Portuguese fortress are two of the many places of interest that have great potential for tourism.